If an arbitral tribunal finds China in breach of UNCLOS, the international pressure on Beijing would be enormous. Tensions escalated between Washington and Beijing last week as a U.S. warship approached an artificially created Chinese island in the South China Sea. But the real threat to China came in the courtroom, when an arbitral tribunal in The Hague held that it has jurisdiction over key issues in the Philippines’ dispute against China over its South China Sea claims. Whether the Philippines wins or loses in the next phase of the case, the ruling will have serious consequences for China’s role as a world power. Although China says its claims to the South China Sea are indisputable, the Tribunal’s ruling only escalates a long-running conflict. Besides being one of the world’s busiest maritime routes, the South China Sea is rich in fish stocks as well as oil and gas deposits. China, the Philippines, Vietnam, Brunei, Taiwan, and Malaysia all have overlapping claims in the sea. To cement its position, China has recently built seven artificial islets over uninhabited reefs and shoals. China believes that it controls the 80-90 percent of the 1.35 million square-mile sea that falls within the “nine-dashed line,” a feature drawn on Chinese maps by its Nationalist government in 1947. Unable to challenge China militarily, the Philippines turned to the law. In 2013, the Philippines filed a case in the Permanent Court of Arbitration in The Hague, asserting its rights to exploit the 200-nautical mile Exclusive Economic Zone that extends from the archipelago into the South China Sea. The Philippines brought their claim under the United Nations Convention on the Law of the Sea (UNCLOS), to which both states are parties. China scoffed, claimed that the Tribunal had no jurisdiction, and boycotted the proceedings. Unable to ignore the dispute, however, China released a position paper that looked suspiciously like a legal brief. Rooting its own claims in international law, China argued that the Philippines’ maritime delineation/entitlement claims were merely territorial sovereignty claims in disguise. Since the tribunal cannot consider sovereignty claims, it therefore had no jurisdiction. The tribunal considered China’s position paper as the state’s position when holding that it, in fact, had jurisdiction. The tribunal has put China in a bind. China immediately stated that the judgment was “null and void” and that any future judgments would have no effect. But it would be hard to imagine that China could completely ignore any future judgment. International pressure on China to comply would be great. The U.S., which has spent five years exerting diplomatic pressure on China over the South China Sea, has welcomed the decision. Germany has actively encouraged China to settle its maritime claims in international courts. Legally, most of UNCLOS is binding on all nations, regardless of whether they are signatories, because the treaty codifies preexisting international custom. A breach by China of law that is foundational to maritime commerce throughout the globe would be a serious international transgression. Refusal to comply with any decision would have strong reputational costs for a country seeking to become a global leader, especially as friendly relations with its neighbors are especially crucial to China’s rise. China is a member of 130 international organizations that apply international law. China thus needs the world to believe that its commitments under international law are credible, especially in the trade and maritime realms on which its economy relies. The Philippines cannot celebrate just yet. The tribunal has reserved judgment on whether it has jurisdiction in seven of the 14 claims. And when the final judgment comes, the Philippines may win on some claims and not others. No matter what, China may still refuse to comply, leaving the Philippines with an angry neighbor and no economic gains. But just by getting this far, the case already has important implications for the use of international courts to manage and resolve international conflicts. International law has become a weapon of the weak. Countries that cannot afford or have no chance of winning military conflicts have increasingly turned to courts to resolve territorial, economic, and human rights claims. Other countries are closely watching the Philippines as they consider similar options for asserting their own rights in the South China Sea and beyond. Vietnam, in particular, is considering filing a similar lawsuit. At the very least, the case may force China to engage in talks with its neighbors to resolve competing claims to the South China Sea. By doing so, China can save face and claim to resolve the disputes on its own terms. 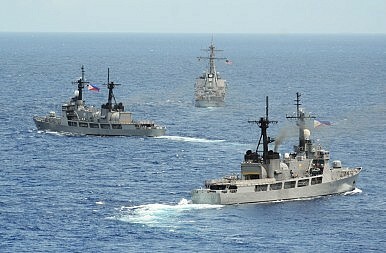 If law can bring China to its knees, cases involving the South China Sea will have ripple effects far beyond its shores. Dr. Jill Goldenziel is a Research Fellow in the International Security Program at the Belfer Center for Science and International Affairs at the Harvard Kennedy School. After winning a victory on the issue of jurisdiction, Manila moves to arguments about the merits of its case.